For some, gymnastics has a misguided reputation for being a solely female sport. However, nothing can be further from the truth. Our Boys Rec classes are for boys ages 6-13 and were created with building the total athlete in mind. Classes will include a variety of gymnastics exercises and stations geared toward improving over-all athleticism, which will benefit participation in all future sports. Gymnasts will have the opportunity to train on Olympic apparatuses such as the rings, bars, floor, vault, and trampolines. Every aspect of our Boys Rec class was developed to improve flexibility, speed, balance, strength, and agility that can be translated into every sport both now and in the future. Whether your child needs to let out some energy or wants to improve overall motor skills, our Boys Rec Class is a perfect opportunity to accomplish their goals in a fun environment with their friends. 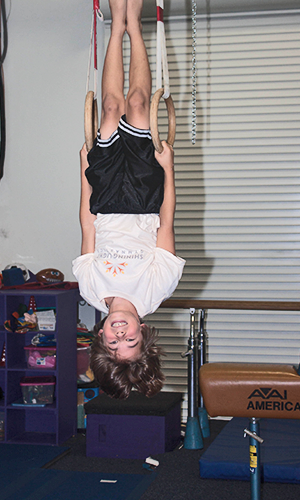 Each class is an exciting and high-paced hour dedicated to developing core strength, tumbling technique, air-awareness, balance, and most importantly - your child's confidence to appropriately challenge themselves.